Cherry mild and fruity. Cherry similar to apple. Good with pork, beef, and especially good to use on poultry because it turns the skin dark brown. This flavor goes good with poultry, beef, fish, and pork. Especially good for ribs. Uncle Robby's Premium BBQ Smoking Cherry Wood Chunks are great for use in vertical smokers and horizontal smokers with a firebox. 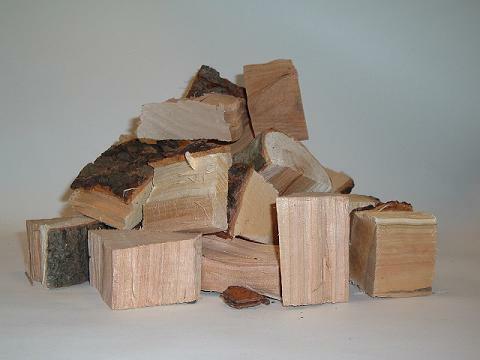 Wood chunks are also great for use in gas grills to give the meat an extra burst of flavor. Uncle Robby's Woods offers the widest variety of smoking chunks. Use them at your next cookout to take your food to the next level. The wood imparts a wonderful flavor to all types of food. Chunks are approximately 2"x2". 320 cu/in. box. Congratulations to Uncle Robby's sponsered BBQ teamLocal Smoke BBQ for taking the Grand Championship again at the 2013 NJ BBQ Championship. This is the third time in five years Fat Angel has taken the top prize in NJ. What's new this month...! We now have in stock all varieties of wood. Find what you need in chips, chunks, or logs. All are sure to make any meat taste better. Our woods are gauranteed to please you and be free of pests or chemicals. If you need a flavor you do not see on our site, let us know and we will do our best to locate it for you!